Engagement party isn’t obligatory, still it is a cheerful occasion for friends and relatives to get together, share a good time and get to know each other. In addition, such a celebration could be considered as a logical beginning of the upcoming wedding hassle. So, if a young couple decided to organize an engagement party, these tips would come in useful. Who is responsible for organizing the party? Traditionally, all the issues related to this event, are decided by bride’s family or friends, however one may ask other relatives for help. Still, it’s better to discuss all the vexed questions with an engaged couple so not to disappoint them. Traditionally, the main guests at the engagement party are parents of a couple, but nowadays more and more Mr. and Mrs.-to-be prefer to organize a celebration only for themselves and their close friends. As an option, one may have two parties: one for relatives and family’s friends and the other for bride and groom’s friends. Some couples take advantage of an opportunity to invite those who won’t be included in the wedding guest list. These are new friends, colleagues or those who won’t be able to attend the main celebration on the appointed day. Of course, today, the easiest way is to send invitations in social networks or by mail. Though, it’s much more creative and touchy to make invitations and give them personally to each guest. They can be ordered in special online stores or one can make them on his/her own. It’s best to start sending invitations in a month before the date. Beyond that, it is desirable to inform guests who live in other cities or countries even earlier, like in two months or more. There is no need to rush the holiday organizing straight away as a bride got a ring from a loved one. The best thing is to have an engagement party soon after the proposal, while the joy is still fresh colored, but one isn’t under the stress of wedding preparations yet. It would be great to agree on a date of the party with parents, relatives and close friends, those guests that one really wants to see at the celebration; to make sure that the chosen date suits them. If one made a decision to celebrate the engagement in a narrow family circle, a gala dinner can be held at home or in a restaurant. The advantage of the last one is that there is no need to cook and do the cleaning after the party. Another good idea is to rent a house with a terrace and to arrange a barbecue. For a big company, it’s preferably to book a restaurant, café or to organize a beach party, or in the countryside. In relation to the latter, one should take into account the weather changes, seeing that rain or strong wind can spoil a celebration. So, in a few days before the party, try to find out the forecast. 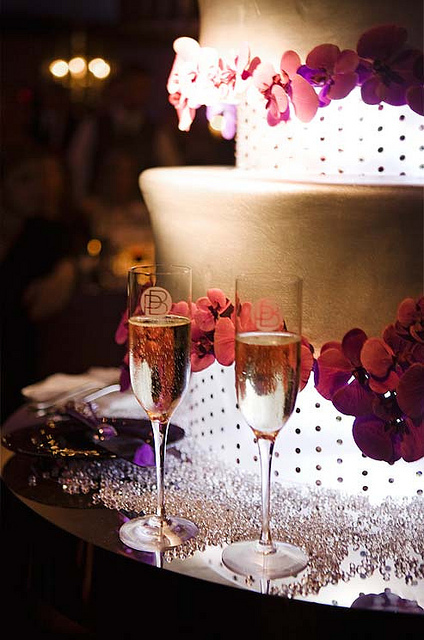 The party theme can be the same as the wedding one or completely different. The first option is good if there are doubts about the chosen topic and one wants to make sure this is something he/she has been looking for. And the second option is perfect in case that a couple has a few themes in mind and desires to implement two of their creative ideas. No matter what decision is made, do your best so engagement party won’t leave behind the wedding itself. Anyway, this celebration is a great opportunity to test wedding professionals such as decorators, photographers, catering service, etc. All the decorations at an engagement party should be linked to a young couple and their future wedding. Candles, bird cages, balloons, confetti and flowers serve as an excellent decoration for the holiday held in the countryside. One may also hang a poster at the entrance or a special board, which will tell a love-story of a bride and a groom. At all accounts, the setting should be button down to a party theme. One more good idea is to embellish a place with photos of a loving couple. It may be central table decorations or pictures on the balloons hanging over the tables, etc. Dainty dishes and expensive drinks are not a must at an engagement party, considering that the wedding will take a big part of one’s savings. So canapés, salads, sliced ​​fruits and vegetables will be a good choice. However, for celebration in the countryside burgers, barbecue, lasagna and pizza are the best thing. One may also prepare a thematic menu; it may coincide with the theme of the party or may be associated with the history of bride and groom. For example, if their first date took place in the Japanese restaurant, the dishes can be of Japanese cuisine. For those who have limited financial resources and can afford only a modest holiday, the best option would be a tea party. So, all one needs to do is to prepare several kinds of desserts and teas. A good advice for a bride is not to get too serious about the attire for an engagement party. The idea is that a bride would better appear in all its glory at the wedding. Consequently, she’d better keep an intrigue for now. So, a bride can wear a simple dress of cream, white or champagne color. A groom can choose a nice suit or just a shirt and trousers. Guests would also rather opt for casual clothes. It’s likely that each guest will want to take “a piece” of this holiday and keep it. So, at will, one may prepare small gifts that will remind guests about the celebration for years to come. It could be romantic pictures of bride and groom, with the date and some pleasant words or familiar to everyone symbol of the couple. Presents can be put on each guest’s seat at the beginning of the celebration or be presented at the end of the evening. When the party comes to an end, do not forget to say a few words to your guests. Thank them for coming and sharing the joy of this solemn event. If one is planning a modest wedding, and some of the guests of an engagement party are not included in the main celebration list, be sure to tell them about it. So there won’t be misunderstandings and hard feelings.